Ketchikan, Alaska - The other day I was sitting in an office with nothing to do. One time I was sitting in a restaurant waiting for a companion to arrive. It was a rare occurrence because in my pocket was my cell phone. I don't normally take it out with me. It is generally bad company, if no other reason than it doesn't respond calmly like Siri when I shout at it for not working correctly. It's one of those flippy phones where all it does it actually make and receive phone calls. That's it. How "last millennium" of me. If I am bored the best it will do is let me call time and temperature, so I can argue with the computer voice that is always two or three minutes fast and is reading a thermometer that is not close enough to the computer's cooling fan. The other day, in the midst of air so cold that my thoughts were freezing, Time and Temp told me it was 271 degrees. Above zero. But then it also told me that the time in the "Kardashian Quadrant" was "24 Smolekian Microboks after Lorfan Six." Go figure. Actually, my 16-year-old son says my flip phone will do a little more than call and send, but since it is not smart enough to do it all for me, I refuse to learn how to do more than make or receive calls. And considering that I usually manage to accidentally disconnect anyone trying to call me, it really doesn't even do both of those things very often. Anyway, I was sitting in a restaurant bored silly. Looking around it appeared that every other patron - including the ones' whose parties had actually arrived - were staring blankly at their cell phones. Zombie Apocalypso was playing on the Muzak. Feeling left out, I took my "go" phone out of my pocket and started to fiddle with it. I was so enrapt at toggling back and forth between "call," "answer," and "missed calls" that I didn't notice my lunch companion had arrived. "What ya doing?" he asked, fully aware that I didn't have a smart phone. "My mutual funds have dropped five percent," I quickly responded. "And the barometric pressure is rising." That last point was an alternative fact, of course. The barometric pressure never actually rises in Ketchikan, because that would signify improving weather. It just keeps going so low that it eventually cycles around and ends up starting at the top of the scale again. We were talking about sitting in an office and being bored, weren't we? Anyhow, while idly passing time in the office, I found myself staring at the grand and august Seal of the great State of Alaska which was taking up an important chunk of wall estate. The seal was so grand and august that it was made of out of a heirloom, investment grade of plastic, like GI Joe's canteen. I guess I had never really noticed the seal before. Sure, I knew we had a "state seal" and I also knew it wasn't the harbor seal or the ring seal or even the fur seal. 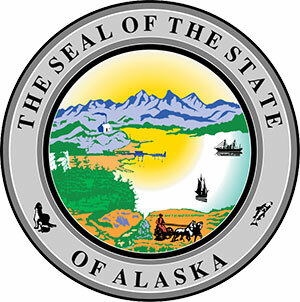 BTW, did you know that the Alaska State Seal is the only one that actually has a seal on it? I read that in a trivia contest once. Actually, I don't know that's true or not. I have no intention of all looking at all 50 state seals to confirm it. I. Am. Not. That. Bored. Anyway, there is a seal and a salmon on the state seal and that's about all of it that makes any sense when you think about it. Originally the Alaska State Seal from the 1800s had the northern lights, glaciers, igloos and an Eskimo ice fishing. Quaint yes, but so last century and not it a cool retro way. So in 1910, the seal was redesigned to reflect some of the economic realities of "modern" Alaska. The northern lights are still kinda there, as "rays" above a large icy, and presumably glaciated, mountain range on the top of the seal. There is a square building with a smoke stack - spewing smoke - that is supposed to represent Fairbanks choking on wood smoke during a winter time temperature inversion. It is actually supposed to be representative of a smelter, a crucial part of the early mining industry. Once upon a time, mining was a big thing up in these here parts. 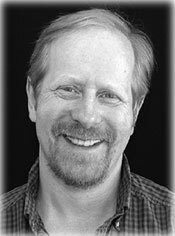 And while mining remains a valuable part of the state wide economy, it apparently doesn't necessarily include oil production, which isn't mined so much as it is sucked out of the earth with a giant straw. Yes, this would be a good point to include a lengthy dissertation on the differences and similarities between "drilling" and "mining." But I just don't care. And neither should you. Now, I have been told that "oil shale" production is considered mining. Fortunately, we in Alaska are less enamored with the idea of digging up billions of tons of rocks and squeezing them so hard that little droplets of oil drip out. Plus, we also have plenty of earthquakes as it is, so there absolutely zero interest in creating more. Beneath the smelter is a dock and railroad, which is important because Alaska has more miles of railroad than any other state. Check that. That's another alternative fact. But we do certainly have more docks per capita than any other state, which means we have the highest level of creosote encrusted barnacles in the world. Just don't tell the feds or they will be concerned about it. I'm sure that our creosote encrusted barnacles are a distinct subspecies of rare and endangered Alexander Archipelago creosote encrusted barnacles. But we certainly don't want to trip the endangered subspecies act, so mum's the word on our spectacular selection of creosote encrusted barnacles. Offshore is some sort of two-stacked steamship, looking very much like a one of those old whaling steamers. Not sure what it represents, because it has been a century since a boat like that plied Alaskan waters. And it clearly has NO tourists on board, so it hardly represents much economic activity. At least not until we decide to start greeting the "Gargantua of the Seas" with harpoons. Down in the lower left corner of the state seal there appears to be a virgin stand of old growth. Haha, got your attention with "virgin," a word that has never been used to describe anything about Alaska. And come to think of it, state seals are round and have no corners. Nothing is in the lower left "corner" because there isn't one. So there. But anyway, there is a stand of forest which I'm sure somehow represents our great natural abundance. The bazzilion acres of trees that keep growing back, no matter how fast we chop them down. Or used to chop them down. We don't do much chopping these days. Now we just stare at them until they die and tip over. To the right of the forest is what appears to be a small two-masted sailing boat which represents..........Well. I don't know what it is supposed to represent. Once upon a time there were sail boats harvesting salmon in Bristol Bay, but this doesn't look like one of those boats. Maybe a fish trap was too hard to draw. Or maybe it just represented a blank spot on the seal and the 1910 "Bob Ross" who designed the "new" seal just wanted to splash a little something there to fill up the space. He probably wanted to draw a bird, but by the time the territorial legislature was done with it, it was a sailboat. Meanwhile, at the bottom of the seal is an odd symbol. What you see is a horse-pulled plow, furroughing its way across a field. Riding on the plow is either Jay Hammond or Billy Brown. Your choice. Farming? Important enough in Alaska to take up so much of the State Seal? Yes, there was a lot of belief at one point that the long summer days could create an agriculture industry that not only feed all of Alaska but export food elsewhere and boost the state economy. Well, that didn't really happen much, did it? About all it does these days is produce the world's "largest" produce, but unless you are feeding a family of 191, an 138.25 pound cabbage isn't all that useful, unless you can marry it to a 100 pound slab of corned beef. Behind the plough are what appear to be sheaves of wheat. Or maybe they are sheaves of hemp (nudge, nudge, wink, wink). And yet, the horses, plow and farmer are the largest non "natural" symbols on the seal. Clearly symbolic of a cluelessness of Alaskan proportions. It boggles the mind. So where is the state seal's aforementioned seal? It and the salmon are doomed to spend eternity chasing each other around the outer circle, bobbing in and out the "The Seal of the State of Alaska" verbiage. As if there is any other state that could be identified by these particular seal worthy images. At any rate, it is a lovely state seal, if not very representative of any Alaska that we recognize. Natch, I have a few minor suggestions to "freshen up" our state seal. First of all, replace the northern lights with clouds. That's how most of us view them. Second, replace the "smelter" with an oil derrick. Or with a Legislator handing a satchel of tax breaks over to an oil company. Third, you can de glaciate the mountains. Although not as fast "non climate change" is already doing it. Fourth, how about several large bales of pulp instead of a forest? Fifth, instead of a sailboat, how about a large permanent fund dividend sailing away? Sixth, the steam ship should obviously be replaced with a cruise ship. Although that would then create the necessity to increase the size of the seal every four or five years in order to "accommodate" the expanding waistline (beam me up!) of the cruise industry. I guess the farmer can stay, at least as long as folks seem to think that marijuana cultivation and sale is going to be the "next big thing." And - to be honest - that's what I was really cogitating on as I was sitting in that office. How someday, our mountains will be covered with millions of acres of Cannabis Stupendous. Alaskans will have more money than imaginable. But only if we can remember where we put it.